Pencaitland is a village of around 900 homes, situated 12 miles south east of Edinburgh and mid way between the towns of Haddington and Dalkeith. The Tyne Water runs through the centre of the village, close to the Church, creating two distinct halves, while the focus at the centre is Pencaitland Cross, traditional stone built houses and cottages, a small supermarket and petrol station, post office and the Trevelyan Hall. Popular with dog walkers and cyclists, there are a number of pathways around Pencaitland, beside the Tyne Water, through the Winton Estate and along the old railway track. (See Winton Walks and Pencaitland Railway Walks.) The pub, the Winton Arms, is situated to the east of the village, as is the bowling club, recreation field and a children's play park. If you're new to Pencaitland, or thinking of moving here, we've gathered some information, below, about local amenities and activities that we hope is useful. While we try to keep contact names and numbers current, some may change. Local events are usually promoted on posters attached to lamp posts on the main street. If you're new here, watch out for details of the annual fireworks display (5 November) and the annual family fun day (end of May) which are good opportunities to get to know people. You are, of course, welcome to join us at Church on any Sunday at 10:45am. 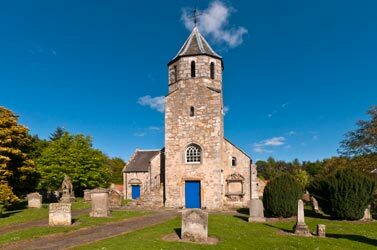 The picturesque church, set in the centre of the village, offers a warm welcome to regular attendees and visitors alike. We meet each Sunday at 10.45am and join our sister church in Ormiston for an evening praise service on the first Sunday of each month at 6.30pm. Other groups and activities within the church include Sunday Club for the younger members of the congregation, crèche, Guild, prayer and bible study groups. Many other activity groups also meet in the Carriage House. Many couples who are married in the Church hold their wedding reception at Winton House, an historic venue in Pencaitland, pictured on the left. The school is a modern primary with a special needs class for up to six children, along with a separate pre-school nursery set in the school grounds. Like all other schools in the region, it opens 4 full days, Monday to Thursday, and Friday mornings. The school has an active Parent Council and Parent Teacher Association. The Playgroup caters for children from age 2 and meets Monday to Thursday mornings from 9.15 to 11.15 in the Sports Pavilion beside the Bowling Club at the east end of the village. Trevelyan Hall, Tuesday mornings, Drop in 10:00-11:45am, £1.50 per session. Open 10am-2pm every Wednesday in the Trevelyan Hall for the older members of the community. Lunch, entertainment and transport are provided. There is always a need for more helpers to join the all-volunteer staff. Training sessions and matches are held for children aged 6-11 on Saturday mornings in the park at the east end of the village. Visit Pencaitland Youth Football Club's website here. The shops and amenities, above, are located on the main road (A6903) that runs through the village and their opening times are included in the download, below. There are farm shops within Pencaitland (e.g. Jerusalem Farm) and regular deliveries of milk, fish, fruit and vegetables from various companies. Please see the download, below, for more information. It also contains details of larger shops a short distance away, healthcare/GP surgeries and local pet care.